Why: You are an awesome Yeastside Member and you want to take part in a Big Brew with Louie and the Angry Horse Crew! Next Saturday, November 8th, we will have our monthly meeting at Louie and Gayle’s house in Montebello. Technically the first Saturday of the Month is the 1st, but with Halloween the night before, we decided to move the meeting to the following week. Your liver with thank you for the change! We have a few great things planned to wrap up the year, starting with a Big Brew at next weeks meeting. Louie, our forthcoming president and master brewer, has offered up his brewing system to demonstrate an all grain brew. If you have not seen his system, it is a quite a thing to see! He is capable of brewing 40 gallons and for this brew, he is offering up wort for participants to take! This is a great opportunity to learn all grain brewing, learn some new things and see a large scale brew, and get together with an awesome group for a club brew. Here is what you need to do if you want to participate. SPACE IS LIMITED SO RESPOND ASAP!!! RSVP with Louie and let him know you would like to participate. Depending on the response, you could get 5 – 10 gallons of sweet wort. Louie plans to start the Brew day at 10a and you should be available to watch and help out. The planned style is a Pale Ale. After you receive your wort, you are responsible to ferment and make it your own. Hopefully everyone would be interested in trying all the different people’s take on the same wort and we can taste it together as a club. Maybe at the December Meeting? We will see!! Food! Louie will have a BBQ available for grilling and good shareable food is more than welcome!! 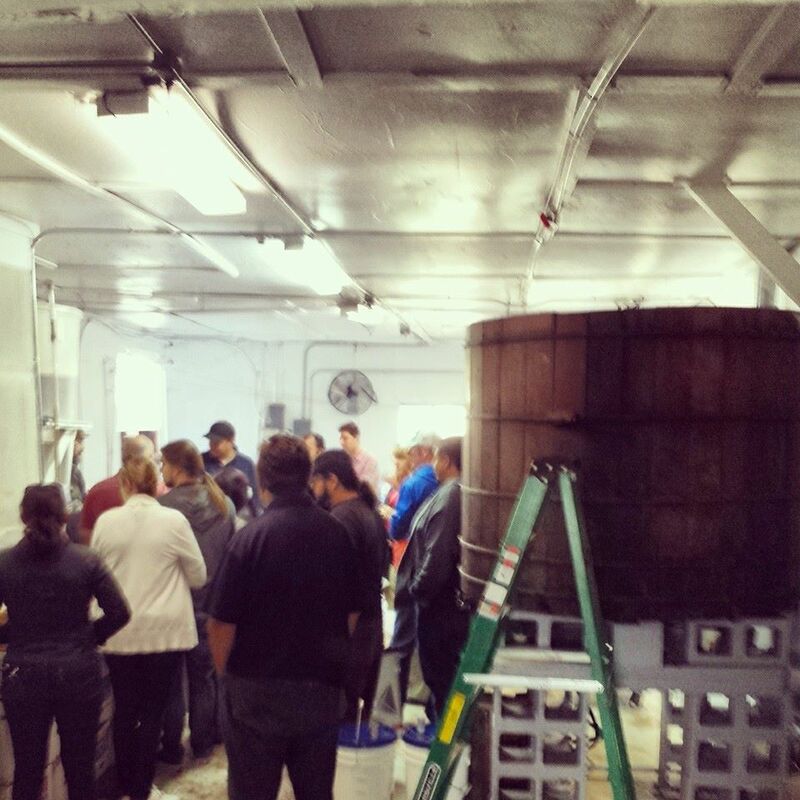 I just want to thank Jerl for planning and organizing our Cider Pressing last weekend. I hope everyone had a great time and I look forward to tasting some great ciders in the coming months. We have quite an adventure planned for our December meeting! As a thank you for being a member this year, we are having a Orange County Brewery Bus Trip!! The trip will be free for current Yeastside Members and will end the year with a bang! All the details are still getting worked out and I will send an email next week with more info and RSVP details. Stay tuned and I am excited to celebrate the great year we have had! California Homebrew Festival is back!!!!!! Exciting news! The Southern California Homebrew Festival is back in business!! As you may know, this years event was cancelled due to language in a Bill that excluded serving homebrew at a non profit event that supports homebrew. Everyone in the state has given time, written letters, and have succeeded in restoring these homebrew festivals. Thanks to everyone who helped make this happen. Next years event will be at Vail Lake. It goes without saying that the Yeastside Brewers will be in full force for the event! Dates and ticket info will be announced in the coming months so stay tuned. Sorry for the delay in this email. I am currently in Richmond Virginia and haven’t been able to send this email. This Saturday we will have our monthly meeting at Old Oaks Cellars in Pasadena. The owner and Yeastside Brewer member, Dave Lustig, was gracious enough to host us for the meeting, and I am really excited to check it out! Parking is street parking, there will be wine for sale, and hopefully we will have a special surprise while we are there. We also have our 2nd Annual Cider Pressing in October organized by our previous president Jerl. We are returning to Snow Line Orchards in Oak Glen on October 26th from 11a – 5p. It is a great event and an excellent way to expand your brewing repertoire. Please RSVP to Jerl Leutz by Sunday, September 28 to reserve your spot. As we are getting to the end of the year, we are starting the process of electing new board members to the Yeastside Brewers. We have had a great year and I want to thank everyone for their hard work and dedication this year. Being a board member is a awesome way to give back to the great club we are a part of and comes with some nice perks. As some of you may know, our current Vice President, Luis, will become president at the start of the new year. The other positions will either be filled by appointment(1 candidate) or by election(more than 1 candidate). Here are the positions that are available. Some of the perks for becoming a Board Member include paid yearly dues for the year on the board, a special Yeastside Brewers T-Shirt, quarterly board meetings with dinner provided, and a chance to impact the club in a positive way! Please respond to this email with the position you would be interested in or see any of the board members at the meeting Saturday. If all goes to plan we will have elections at either or November meeting or at the December meeting. Here is the current point tally for Brewer of the Year, counting ribbons won in the LA County Fair. Pacific Brewers Cup results have not been added. November’s meeting will be at Angry Horse Brewing!